It had been a couple months since my step-son moved out of the house, leaving the wife and I empty nesters for the first time. Ironically, the water bill didn’t offer any evidence to the fact. To my chagrin, our bill had actually managed to climb upwards. It just didn’t add up. We had a young adult living with us who took daily showers, ran the faucet and washed his own clothes. Surely his absence would leave a dent in the bill? Right? I decided to be patient and waited for the next water bill to arrive. Sure enough – the bill told the same story. No improvement in the charges. I took the matter to the city’s utilities department and inquired about what might be the issue. Leaks? We don’t have any leaks in the house. I would know if we had leaks! 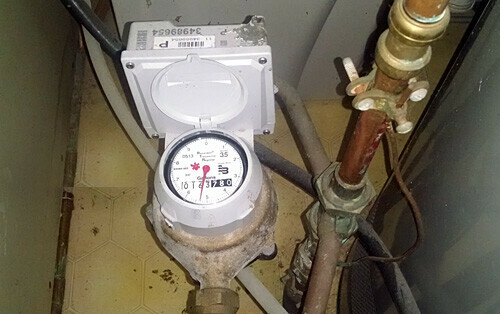 Water softener – if you have one, how often is it recharging/going through cycles? Those can use 150 gallons per recharge. How often are you running the dishwasher? Those consume 4-15 gallons per load, depending on the age and efficiency. Do you turn the water off when brushing teeth? If left to run, that can equate to up to 20 gallons of water per session. Whoa! I couldn’t believe how much water we could consume. The administrator at the city gave me a really handy way to check our house for a water leak. It’s super easy and I wanted to share it with you in case you are ever suspect of a water bill that seems to be creeping up. Note the reading. Do this at night – right before bedtime. Ours has a cap over it – just lift that up and jot down what the reading on it is. You’ll likely only need the last 3 digits. Be sure there’ll be no water running. Sometimes your water softener recycles or you flush the toilet during the middle of the night. If you can avoid any of this taking place overnight, you’ll get the best results. Check the reading. When you first awake, be sure you check the meter right away. When I did this, I checked the meter at midnight and then again at about 5am – before I got up for the day – to see if the meter had moved at all. One of the most common leaks is the toilet. Usually you can hear the water running, but not always. You can put a few drops of food coloring in the tank and wait to see if any colored water runs into the bowl of the toilet, without flushing it. If it does, you have a leaking toilet. This would be a fairly minor leak. Most water softeners, humidifiers or hot water heaters have a hose or an easily seen leak leading to a drain in the utility room floor. Feel the end of the hose. If there is any water coming out, this is where your leak is. This may be a pretty major leak. While our bill eventually saw a decrease in the next billing cycle, it has still left me a bit uneasy. I don’t know many people who regularly check their meters to see if they are matching up with their utility bills. This experience has certainly taught me to keep a closer eye on it. Hope this helps in case you are experiencing an unknown uptick in your water bill. Have you ever had a water leak issue like this and what was the problem? You may want to purchase a Streamlabs Smart Home Water Monitor ($199 at Amazon) to keep tabs on water flow in your home and notify you of any leaks. I really like how you talk about water leaks and things to look out for. This is something that I have been curious about as I have noticed higher water bills lately. It would be great if I could get someone out here that could maybe take a look around, maybe one of the sprinkler lines busted. I know for us – the city has raised our rates this past year too – but always good to check and see if there is something more sinister going on. Really good tips Aaron. 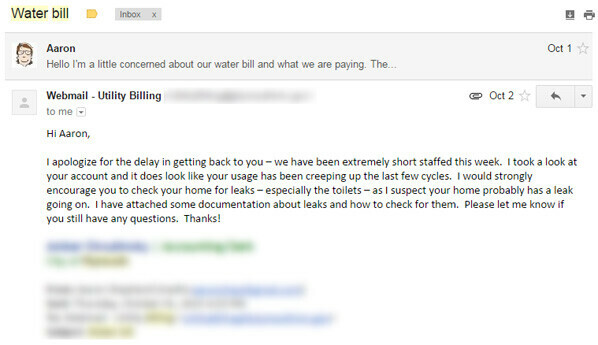 Our water bill has stayed consistent the past 5 years but we actually did have a leak that went on for so long that the water bill gave no clues to it. We found it after our renter moved out – thankfully we planned on gutting the kitchen anyway! Oh geez – hopefully insurance was able to cover? Ah the joys of living in the country! Another source of water loss that many customers forget about are water powered back-up sump pumps. They get tripped and quite often don’t turn off due to lack of use and maintenance. Good thought Chad – thanks for the tip! Lots of great tips, Aaron. We had a huge spike in our bill a few years back, when meter readings were done manually. We asked for a do-over and turns out the water co made an error. I’m glad your city administrator was helpful. Wow.. I’ve always wondered how often errors happened in the past when it was mostly done manually. I once suspected a leak and used both of these tricks (the water meter and the food coloring) to check, and turns out that we didn’t have a leak. Great tips Aaron! We had a water leak one year that was caused by busted sprinkler line. I knew i had a problem because my water bill kept soaring more and more each month. So another tip would be to make sure your sprinklers aren’t running at night when you are checking the water meter. Our problem with the busted water line was caused by an improperly blown out sprinkler system. Ugh – how frustrating! Was worried we had the same thing one year when we had water coming through the wall (ended up being ice dam).